Last year, many were shocked and alarmed that HomeDepot took the #1 spot online in Google's powerful search rankings for video surveillance. Now, a rival has taken the new spot. While HomeDepot did not drop far, this competitor made a big jump up the charts and is a significant threat to the long term future of video surveillance providers. Moreover, the top result tends to get a very large portion of those searches, so this could mean 100,000+ additional visitors to Amazon each month looking for video surveillance. 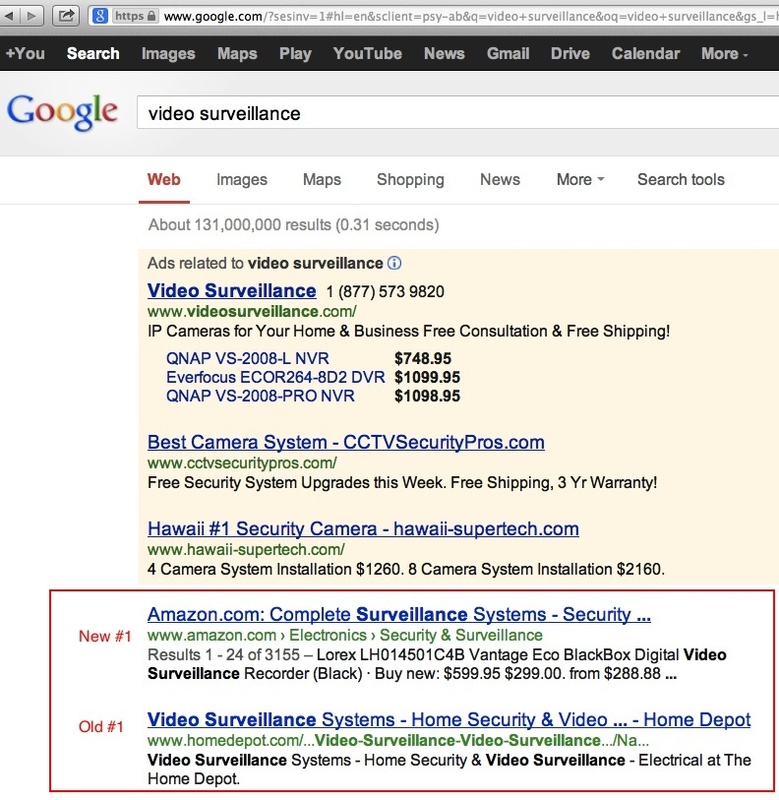 Google is sending 'video surveillance' visitors to Amazon's directory of top sellers in 'Complete Surveillance Systems.' The number #1 result on that page is Dropcam, the Silicon Valley VSaaS startup. Ironically, not even two months ago, we ran a review titled, "Dropcam's Sales Surge and Amazon's Growing Power." Of course, Amazon's improved search result positioning should help Dropcam even more - being the #1 result of the #1 match for searches to 'video surveillance'. Industry people have rightfully been worried about Internet product sales for years. However, in the past, Google rewarded an array of small time resellers and SEO spam sites who were not particularly powerful. Now, with massive changes to its rankings, Google is emphasizing mega resellers whom many already trust and use. With Google's immense scale and influence on buying decisions across the board, this shift will have a material impact on what cameras are purchased and what suppliers grow. Incumbent resellers and manufacturers invest heavily in search engine optimization / rankings to potentially unseat the mega resellers for video surveillance related terms. Incumbents actively work to become top suppliers to these mega resellers so that their products appear high in the resellers pages that Google directs traffic. Accept these incursions as a fact of life and redirect efforts to higher end market segments where purchases are less likely to be made directly over the Internet. Whatever path is chosen, it will not be easy and, unless Google changes course, expect an increasingly prominent role for outside mega resellers.